Happy Monday! I hope you all had a wonderful, safe 4th of July. I actually didn't see any fireworks this year, which is a story for another time. But, I did have a great holiday spent with people I love, so there isn't much more that I can ask for! This outfit is probably one of my favorite wear-to-work looks lately. I am so glad I snagged this skirt from H&M when I was in New York last month... I wear it all the time! I actually got stopped in the grocery store by a really nice lady who wanted to tell me that she "loved my outfit." So I told her about my blog and she promised that she and all of her friends would become new readers. Juuuuuust kidding. I don't tell anyone about my blog. Ever. I just said "Oh, thank you so much." And left it at that. Love that skirt! Great, versatile piece! That necklace is also amazing!! It's always so nice when strangers compliment you! I think you hit the jackpot with that skirt! It's so pretty and I am sure you can wear it year round! How pretty the lace is in the breeze! cute skirt! I just got a similar one and I love it! Hahaha I don't tell anyone about my blog ever, either. And I didn't get to see any fireworks this year, too! Love this skirt, it looks great with the green top! I love this outfit, great skirt find. haha I was reading your interaction with the lady and thought, "wow I'm never brave enough to talk about my blog!" haha glad I'm not the only strange one out there who never ever talks about her blog. omg I was like "you are so brave!" because I never tell anyone about my blog. my friends and boyfriend do that for me, mostly because they like to see me squirm about it. We missed the fireworks this year too! Kind of a bummer! 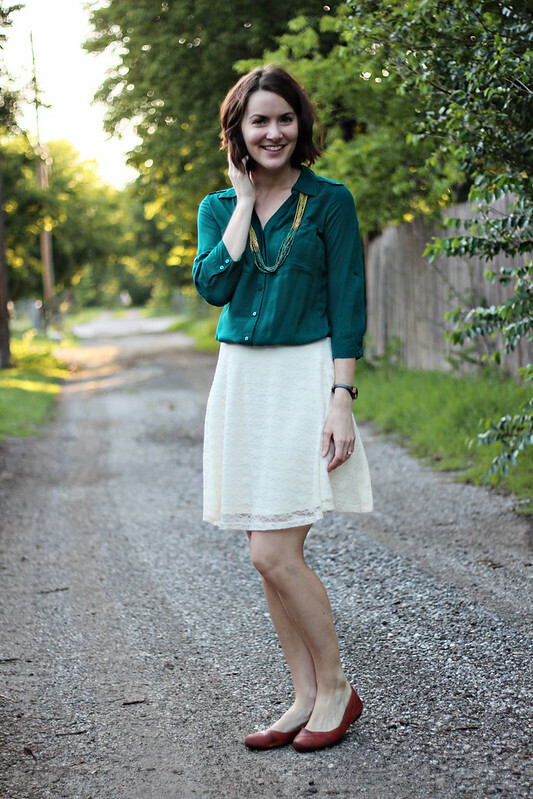 LOVE this skirt, and I'm so with you on not telling anyone about my blog! Love the story! That skirt is awesome. I sometimes tell people about my blog...but not a ton. Ha ha. You mean you don't have business cards to hand out for your blog? And before anyone bites my head off, there is nothing wrong with that, but I am the total opposite. I don't tell anyone about my blog and I even get kind of embarrassed when my kid's friend's moms find out. I even "un-linked" my Instagram from Facebook so my way-back-when former high school classmates wouldn't follow me (even though some snuck through - I have to wonder what they really think). This is a super cute look though and I would totally compliment you because I will randomly tell people they look cute. Very very few people now about my blog and except my husband, everyone else that knows found out on their own. I adore your hair more each week and that skirt - love. Also stranger compliments are the best! That skirt is so pretty girl!! I love this look. 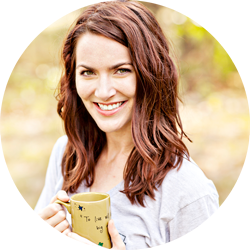 PS found you through Lauren's linkup! The skirt is very pretty. Compliments from strangers are the best! You totally should've told her, but I have a hard time talking to people about my blog too. I love the way that skirt twirls and it's so beautiful for summer. Getting a compliment always makes my day! This outfit looks great on you. That green is perfect on you! I love the skirt!! And I'm the same way about my blog...I never tell anyone! I've never had anyone ask me what I'm doing when I take pictures for it, and I hope it stays that way, because it would be so weird to explain. Haha. haha, you had me going for a moment there-- I really thought you did tell her about your blog. I've been considering linking my blog to Facebook, but I just can't do it. Not yet, at least. hahaha i was like wow, you told a stranger about your blog? props! haha. i dont tell anyone either, sometimes it almost slips lol. that skirt is super pretty though, and the colour of the blouse looks so great on you! ha! inevitably while I'm at work I'll be talking with a friend (that knows my secret) and an outsider will come along and say "you have a blog?" so I have to say "yeah...just for fun." that is a pretty skirt and way to master a twirling shot without looking ridic, I applaud you! when do we get to the the story about missing fireworks? Your hair looks fabulous! and lovely look of course!! I never talk about my blog either. Such a pretty skirt! 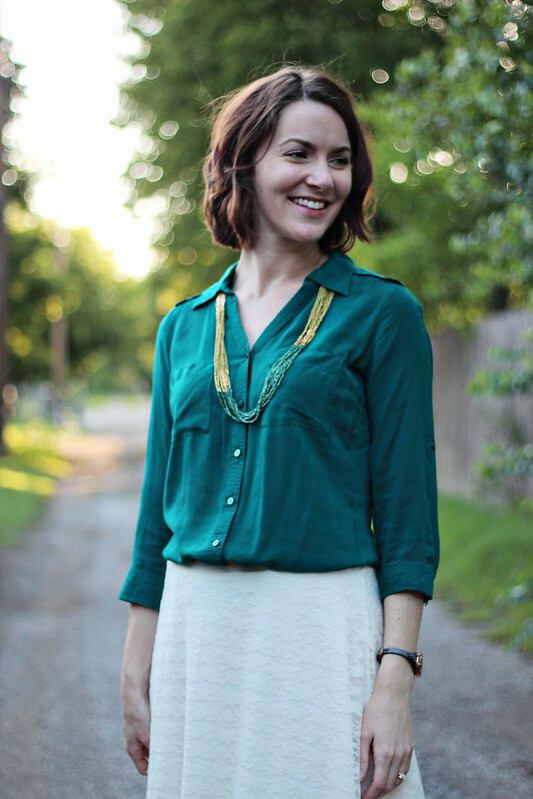 Love this outfit and your green and gold necklace! Oh my gosh, you and me both!! The only people who know I blog are my best friends and my coworkers. Plus the few people who have found me on Instagram before I took my full name off it. I would have stopped you too. That top and skirt are absolutely beautiful on their own but together is just stunning. I absolutely love my Born wedges and have been on the hunt for more Born shoes as they're the most comfortable shoes I own. How are flats? Are they super comfortable too?